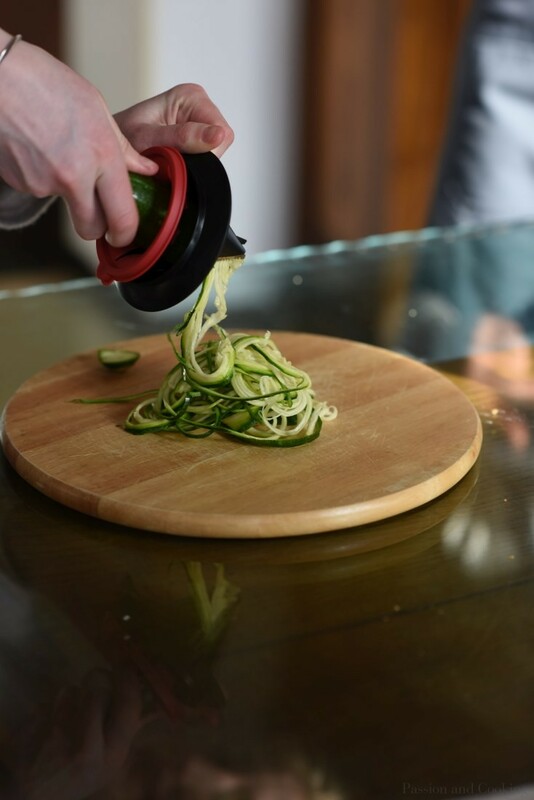 Do you like authentic and healthy Italian cooking classes at Lake Como? Is it difficult to find real Italian recipes taught in English by an Italian from Como, with measurements in both grams and cups ? What better way to approach this experience with an Italian life coach (The Mamma Mia! Diet), cook and medical researcher. I was born in Como (Italy) on the shores of the beautiful lake (Lake Como) which bears the same name.I lived abroad for about a decade and I have returned to Italy to enjoy my stunning lake. Cooking has always been my passion and I am very happy to transmit that. When I was a little girl I loved to cook, spending hours in the kitchen with my mother, making a mess but learning delicious traditional Italian recipes, using local, seasonal, fresh ingredients and preparing everything from scratch. Today, I am still that same little girl playing in the kitchen; I like to experiment with different tastes and textures, tingeing from the Italian culinary culture to create my own personal recipes. However, I try to remain faithful to the authentic Italian traditions, flavors, and ingredients. In Italy we say that “A tavola non si invecchia” (one does not grow old at the table); the pleasure of good food, wine, and company is such that the passage of time is suspended. 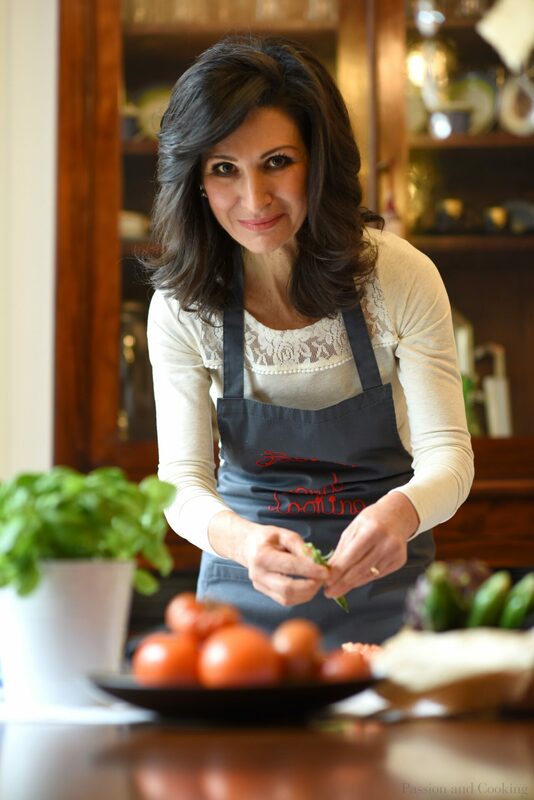 I offer fun, informal, hands-on and personalized classes about healthy Italian cuisine, nutrition, culture, Italian etiquette and language. I teach in English or Italian, using both metric and imperial measurements. The idea of my cooking class is to give you the flavor of true Italian lifestyle through food, an experience for all senses. You will live like an Italian for a few hours. 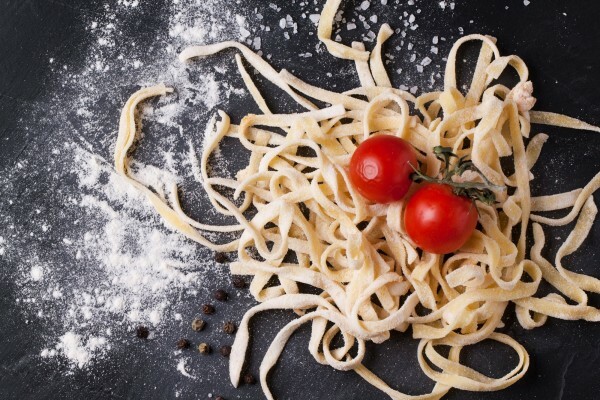 You will learn some Italian words while cooking delicious local Italian food as well. At the end of the course you will receive a copy of all recipes prepared together. You can also purchase my book Love is Eating with 10% discount. Italy and many other Mediterranean countries have big street markets. They are part of the culture and are held 2 or 3 days every week, usually in the morning. In Como there is a big and typical market each Tuesday, Thursday and Saturday where local producers sell their own fresh and seasonal products. 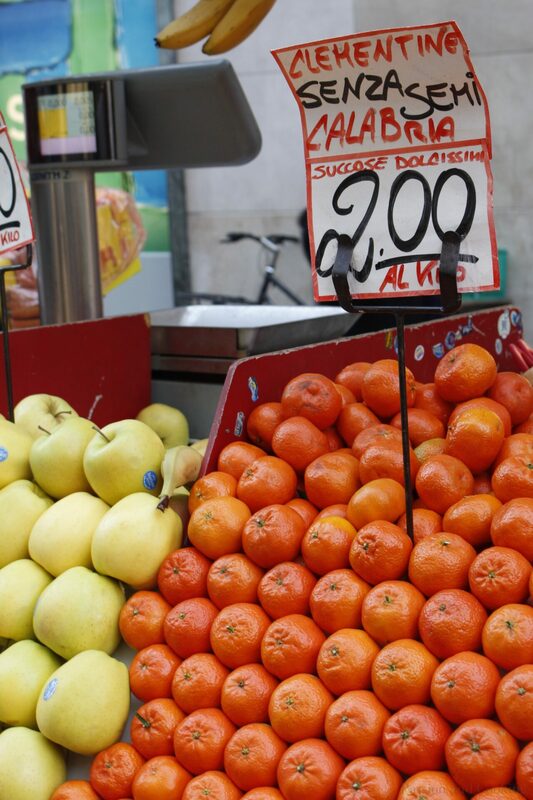 Italy is great when it comes to fresh fruit and vegetables, as it offers fantastic products all year round. 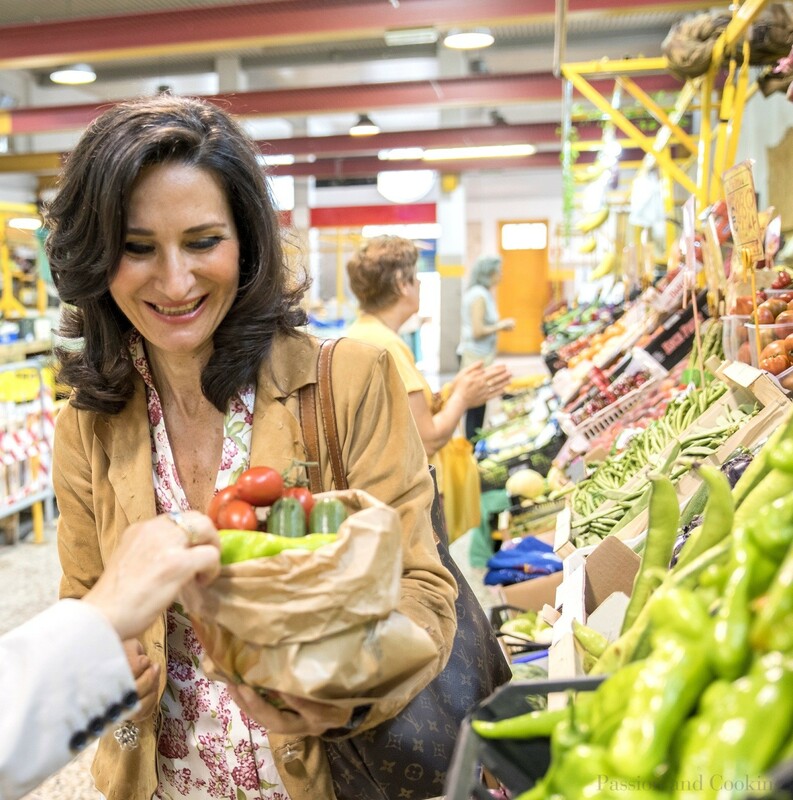 The market experience is a stimulating assault on the senses: the smell of herbs and spices, fresh seafood, local fresh cheese – not to mention the dozens of rows of colorful produce! Last but not least, you will experience the cultural flavor of how Italians interact when they go to the market. You will be welcomed with an appetizer and a glass of prosecco just to set the atmosphere. 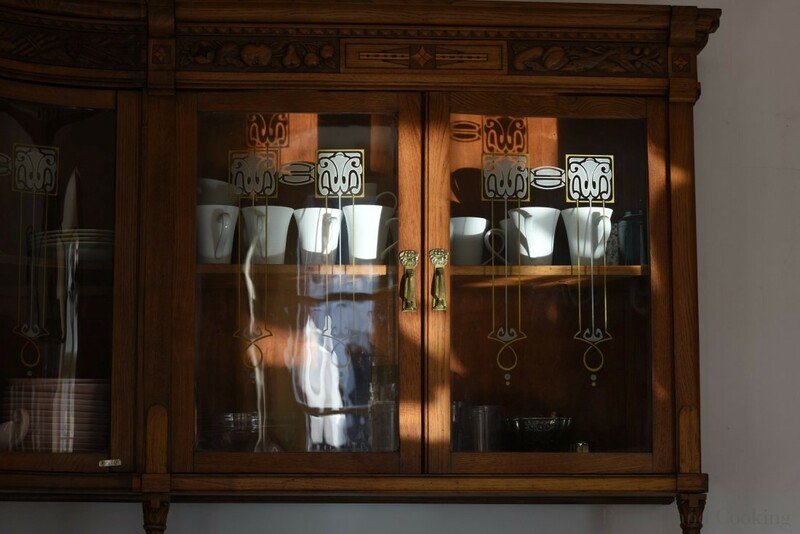 The menu will include three different recipes using local seasonal ingredients (chosen from my blog according to your taste and diet, including a first course, main course and dessert) and different high quality wines (including local wines) according to the dishes served. It will last for 3-4 hrs. A selection of digestivi will be served after dinner. The lesson will be held in a cozy and family environment (my house in Como), so you can truly understand our culture, passion for food and “bon ton” at the table. We can eat together all the delicious dishes prepared. It will be a unique and different cooking experience with an Italian family! Above all expect plenty of good food and many stories to tell. In Italy you live and eat well! Come, cook and have fun with me! 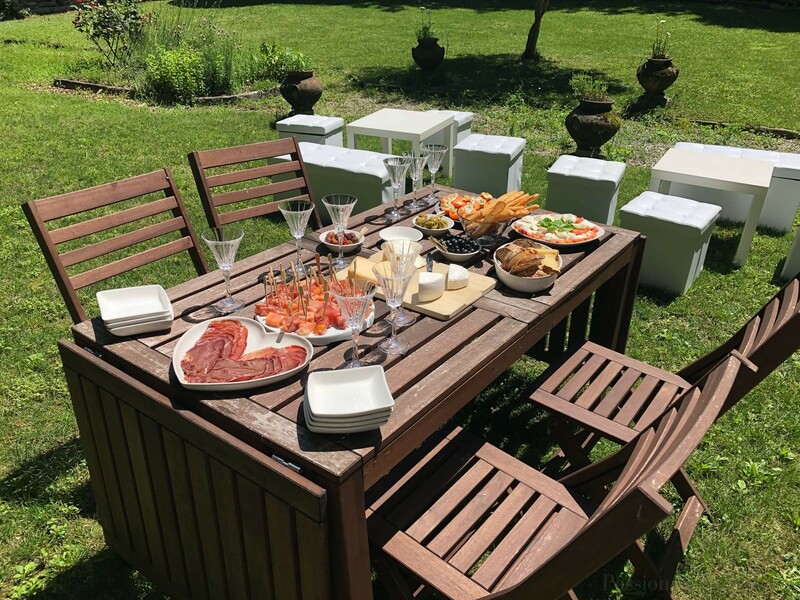 Upon request for large groups I can held the cooking class either in a exclusive old palace in Como with a stunning garden where we can have an aperitivo or in an amazing contemporary art store (S2 Style, Como). See pictures in the slide show. Italian style for Italian food. The cooking class was FABULOUS. Paola was gorgeous – talk about an Italian Glamazon. She was so generous and gracious and interesting. The markets were great and it was so gorgeous going back to her house to cook. She was so easy to spend time with and her daughter also interacted with us which was great. At the end we all sat together and ate lunch. It was fantastic. I would highly recommend it. Thanks Paola for an inspiring, professional and easy to follow class on how to make pasta. Your style of presentation is clear, personal and entertaining. 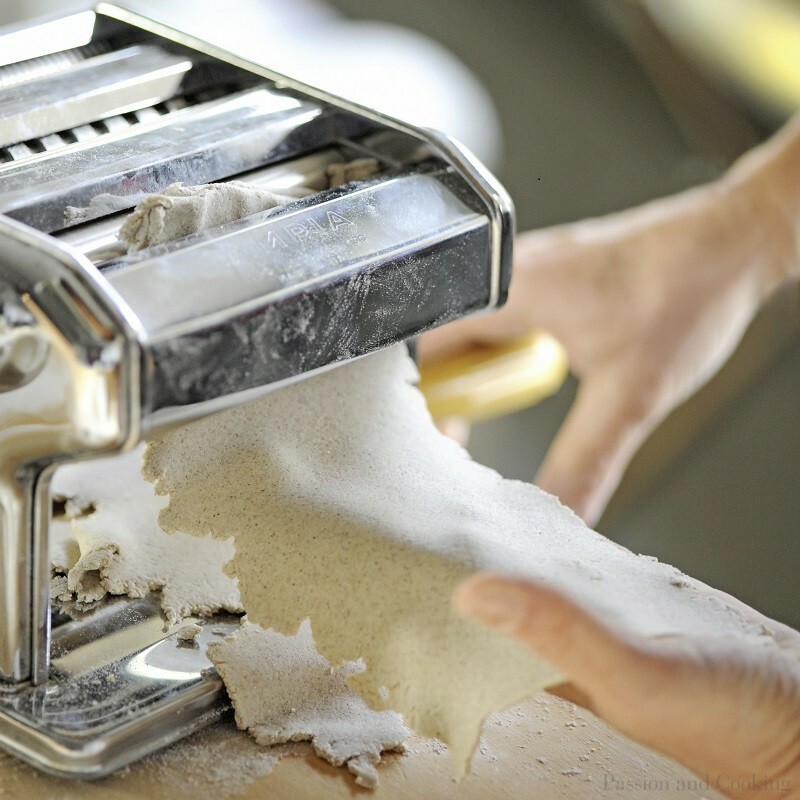 I’m always inspired by your recipes and looking forward to making home-made pasta. Bring on the next Paola! My family took a cooking class in Paola’s home and it was the best part of our Italian vacation. Paola and her family were gracious and generous, inviting us into their home, which in itself was so interesting to see. 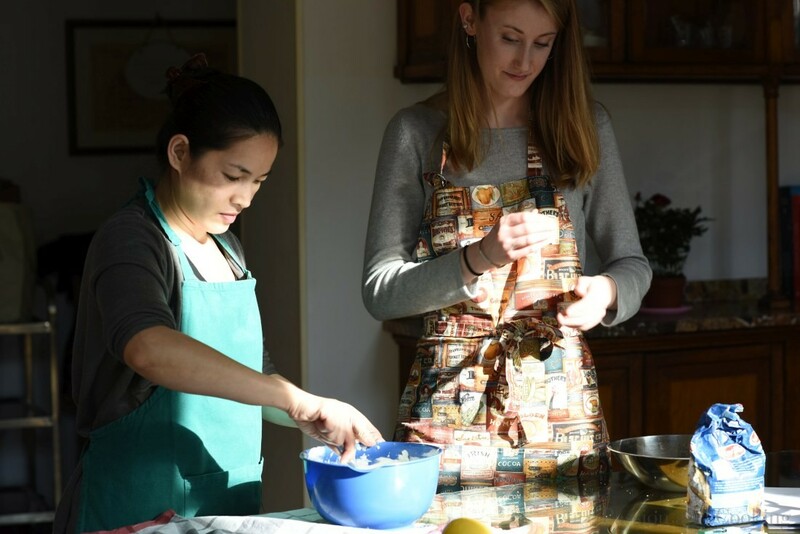 Not only were we treated to a fun and educational cooking experience, we were able to ask all sorts of questions about life in Italy on topics that were of interest to our family and we would not have had a chance to learn otherwise. 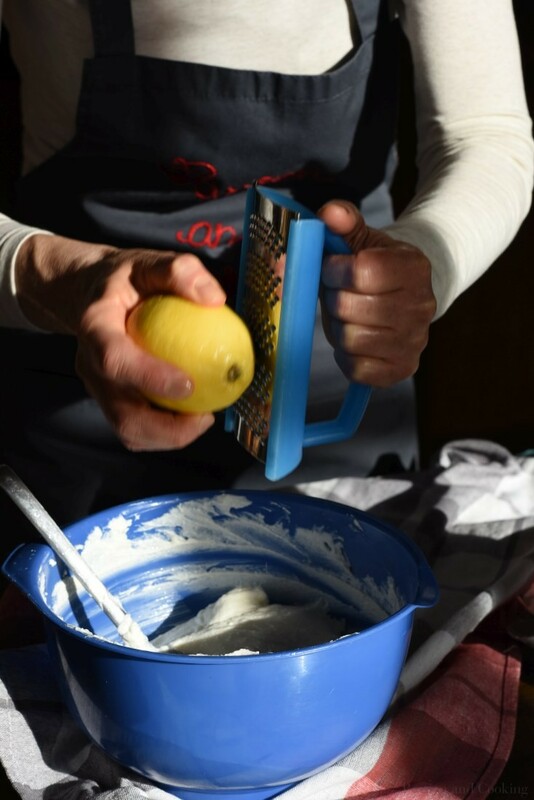 It was so much more than a cooking class: a true Italian experience. Her daughter spent the entire time playing with our 5 year (who said this event was THE BEST EVER) and her son was charming and accommodating to our 11 year old. I cannot stress enough what a spectacular day we had learning from and eating with Paola. I would HIGHLY recommend including time with her in your itinerary. On a side note: I’ve made several items from her cookbook so be sure to pick that up too. 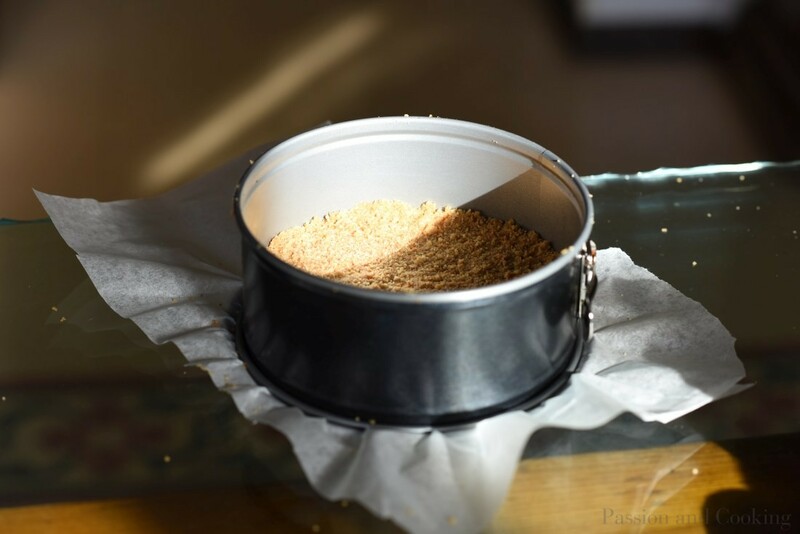 I have been meaning to post about my experience with Paola Lovisetti-Scamihorn’s cooking class in Como, which I took twice. She makes excellent, fresh Italian cuisine without the sometimes caloric heft one finds in restaurant food. My personal favorite: the zucchini spaghetti! 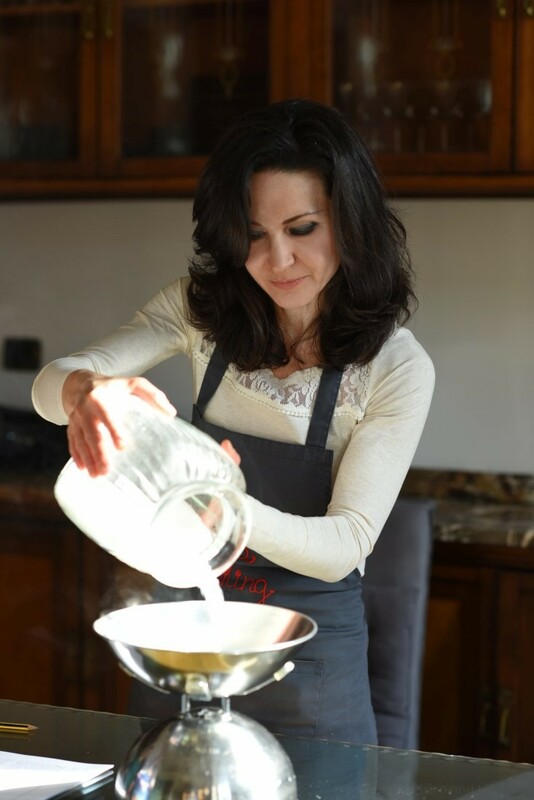 Whole-heartedly agree with Remarqed that, for a vegan traveling through Italy, this was one of the most unique cooking experiences I was able to share with Paola Lovisetti-Scamihorn while in Lake Como. 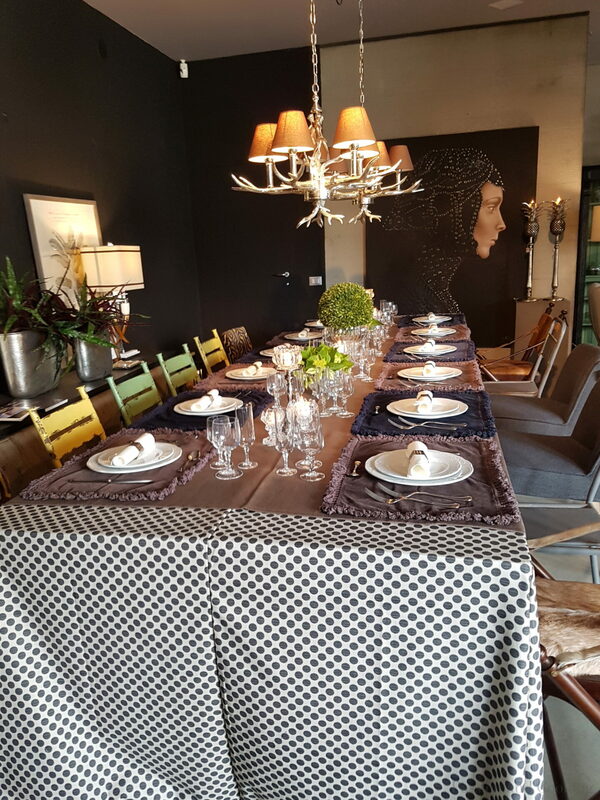 Not only was it an intimate setting with friends and family, it was not the typical fare one might associate with Italian dining. She was extremely careful of dietary restrictions and making thoughtful choices for a full-bodied, classic yet contemporary meal! Highly recommend contacting her if traveling to the Lake Como area! Looking forward to learning and cooking with you tomorrow. If you see this note..can you offer us suggestions on parking? We will be tryibg to use GPS..driving down from Tremezzo..meeting you at 11:30am. One if the highlighta of our trip was the special cooking lessons with Paola Lovisetti-Scamihorn in Como. We spent over 4 lovely and informative hours with this amazing lady learning the art if cooking italian! And her son gave Em the tutorial on the secrets if making homemade pasta. To top it all off, we then had dinner with the family. I want to say if you are ever in Como and want to learn to cook Italian, get in touch with Paola. She has a blog and an amazing cookbook, “Eating is Love”. Get the book! We were totally blown away by the hospitality of this lovely family. Thanks again, Paola! Cooking with Paola was much more than just a lesson in the culinary arts. She invited me into her home with her loving family, and treated me like a daughter, a sister. I spent 3 exciting, eventful months traveling Europe and this was the pinnacle of my experience. Paola’s infectious personality framed her impressive knowledge of the ingredients and science behind the perfect dish. Over vino and many laughs, I was treated to memories that I will always hold close to my heart. My only regret is not having the chance to meet her daughter. The next time life takes me to Italia, I will absolutely be coming back for seconds! Although I was born American, Paola and her family is and will be my famiglia italiana per sempre. Everyone should take a cooking class with Paola!!! My boyfriend and I accidentally showed up so late (be careful if you’re driving because finding parking can be a little tricky…just give yourself some extra time just in case) but she was so forgiving and so welcoming. 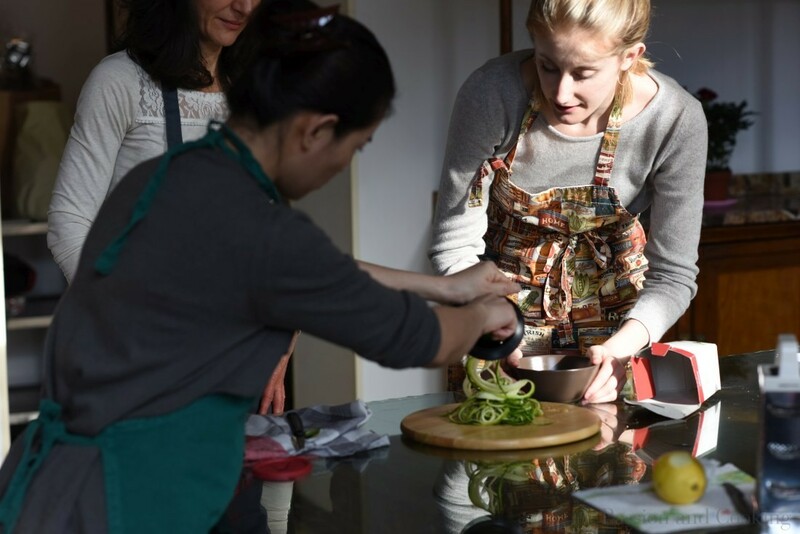 Unlike other cooking classes that are offered, you cook in her home so you feel like a friend of the family rather than an ordinary customer and it really makes all the difference in the world! We had the pleasure of meeting her entire family and cooking some of the best food we have ever tasted! We spend almost 6 hours cooking, eating, and talking with her family and really had one of the most memorable experiences during our trip to Italy. My boyfriend and I have degrees in nutrition and we were so impressed with Paola’s knowledge about nutrition and food chemistry so we had some great and interesting nutrition-related conversations. And definitely buy her cookbook! We just got back from our trip so we haven’t tried any of the recipes yet but they all look so delicious and we can’t wait to cook and try all of them! Thank you so much for your sweet message. I really enjoyed meeting you and cooking together. It was so much fun. It is also very nice to have clients interested in nutrition with whom I can share my passion. Please feel free to contact me anything you need about Italian cuisine. Do you offer classes for a family with two young children.? Thanks for your request but my house is not baby-proof anymore, therefore I prefer not giving cooking class to family with young children. My boyfriend and I recently did a cooking class with Paola. It was one of the highlights of our trip! It is not just about the cooking, but about the love that goes into food and its place in Italian life. We started off with a trip to the local markets, which was an adventure in itself. We absolutely loved the experience of shopping like the locals do and sampling our purchases along the way. Paola then graciously opened her home to us for the cooking session and lunch, with a quick coffee stop beforehand. Paola goes to such much effort to make the experience personal. I was really keen to do a cooking session where I didn’t feel like a number, stuck behind a kitchen bench, following orders. Our experience with Paola was far from that. We cooked in her home kitchen together with her beautiful family and then shared lunch, discussing travel, culture, food and more. We can’t recommend Paola enough. Do u have a class for availability for 4 people between 28-31 Aug ? How much would this be per person and does it involve making fresh pasta and a dessert? We were so lucky to have found you and the opportunity to take your regional cooking class. Imagine our surprise when you explained the class will be held in your own home and the dinner we made would be served at the family table. So different and unique from the other cooking classes where strangers gather in the kitchen of a restaurant. It made everything so personal, like cooking with family or friends. We enjoyed our cooking experience with you and learned so many different tips and techniques for making the bolognese sauce with homemade pasta. And that torte caprese! While still in Italy I went to the grocer for the chocolate so I can make the cake when I am back in California. To anyone reading this, I highly recommend Paola’s cooking class simply for her knowledge, love of cooking, her farm to table approach and of course her beautiful family. Thanks for your request. I wrote you an email with all the info requested. 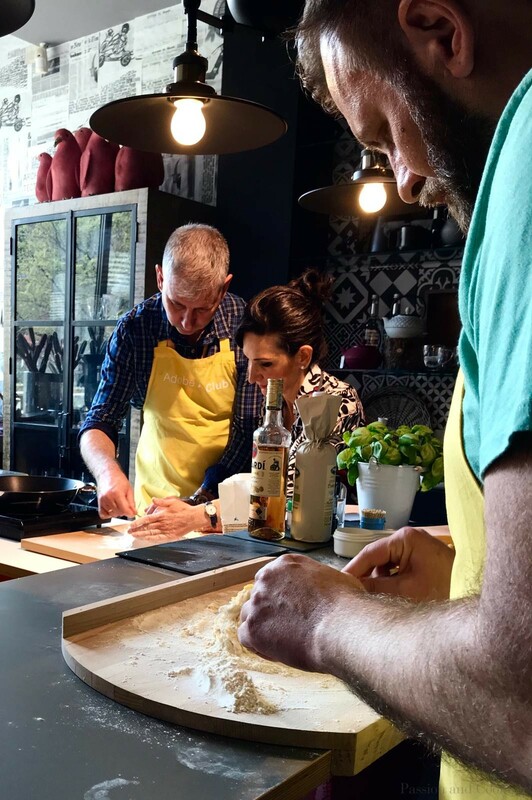 One of the highlights of our trip to the Lake Como region of Italy was the very special cooking lesson we had with you and learning the art of cooking italian! When you graciously opened your beautiful home to us and went out of your way to make the experience personal, taking the time to discuss travel, culture as well as food, and allowing us to meet your daughter, it was more than we could hope for. Our 4 lovely and informative hours were amazing and went by so fast and we were made to feel like we only wished we could have spent more time with you and the rest of your family. But you graciously helped us leave before dark so we could find our hotel on the twisty mountain roads. You have a wonderful personality and your vast knowledge about nutrition and food chemistry are so impressive that we cannot wait to come back and see you again to learn more. But until then, I will follow your blog. The fact that you are friends with Marguerite and Piero who are the owners of the Hotel Villa Aurora, where we stayed was so much fun. We had a sensational vacation staying there the rest of the week and enjoyed their gracious hospitality very much. It was a gorgeous setting and we could not have asked for more. We also enjoyed their restaurant very, very much. Paola, before we went home, we did go back to Como to buy the ceramic knives. They are wonderful and I love them. And I am so glad to have your cookbook so that I will have many new recipies to try. I also look forward to getting the Mama Mia Diet cookbook on Amazon too. I know they will inspire me to cook healthier and more nutritious meals for my family. Thank you for giving us these beautiful memories that we will always hold close to our heart. Cooking-class with Paola Lovisetti Scamihorn for me was an unforgettable experience! 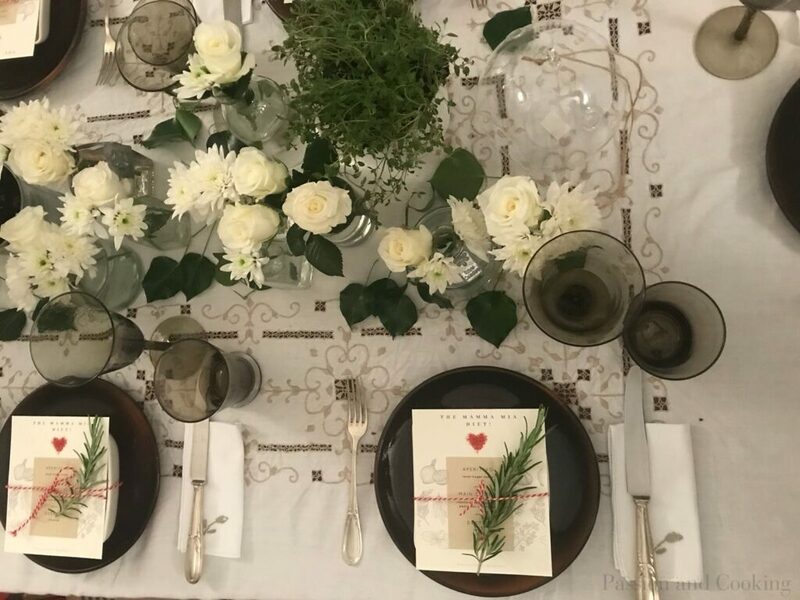 Elegant Italian house, welcoming owner, every detail was thought over and prepared: decorations, printed menus, flowers, aprons, snacks, aperitif. Paola is not just a great chef; she holds the Master in Medical and Pharmaceutical research, writes books and articles dedicated to healthy food and Italian cuisine. At the cooking class, I discovered a lot of useful and exciting information about nutrition, Italian cuisine, customs, and traditions. I was fortunate to have lunch at the fantastic Italian house with a lovely, smart, wise and elegant Paola. It’s a priceless experience. Highly recommended. Paola is the real deal! An Italian chef, a knowledgable foodie and a charming and inviting hostess! I thoroughly enjoyed my afternoon with Paola and learned a lot! I have put a few things into practice since my cooking class with great results and am actually contemplating buying my first pasta making machine! She truly inspired me and I hope to learn more from her in another class soon. Highly recommend! Allen and I are back stateside after a wonderful trip to Italy, culminating with our visit to Como, where we met you for a special day of cooking, conversation, and sharing a delicious meal. We thoroughly enjoyed ourselves and learned many new things along the way. There’s nothing cozier than making homemade pasta on a cold, rainy day. We also appreciated your restaurant recommendations and had a wonderful meal at Colombetta after our drive around the lake. Truly an ambitious day! We’ve ordered both of your books and look forward to receiving them and sharing your recipes with family and friends. We will certainly see you again on our next trip to Como. It was my pleasure meeting you and cooking together. Working as a team made the class so special. I am happy you enjoyed the restaurant I recommended. It is one of my favorite ones for fish. Thanks so much for ordering my books. Early this afternoon I signed and mailed Love is Eating. Please let me know when you receive it.